“Dust and Shadow” in concert feat. Bryce Pinkham, Drew Gehling, Lilli Cooper, Kevin Massey, D. C. Anderson and more Monday July 17th, 2017! The July 17th concert marks the first time “Dust and Shadow” will be presented to the public.Rachel Flynn will be directing the star-studded evening with music by Jonathan Reid Gealt, lyrics by Dustin Sullivan and a book by Kasey Marino. Matt Hinkley will be rounding out the evening’s creative team with orchestrations, additional arrangements and musical supervision. The evening features TONY and GRAMMY nominee Bryce Pinkham (Gentleman’s Guide) as Sherlock Holmes, Drew Gehling (Waitress, Roman Holiday) as Dr. John Watson, Lilli Cooper (Spring Awakening, Wicked) as Mary Ann Monk, Kevin Massey (Gentleman’s Guide, Memphis) as Constable Edward Bennett, D. C. Anderson (Phantom of the Opera) as George Lusk, Alexa Green as Mary Ann Nichols, Julia Burrows as Annie Chapman, Sally Eidman as Elizabeth Stride, Amy Toporek as Catherine Eddowes, Jenny Ashman as Mary Jane Kelly and Michael Deleget as Johnny Blackstone. The concert also features Patrick Massey, Nicholas Ryan, Jamal Lee and Kyle Robert Carter. 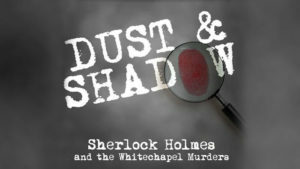 “Dust and Shadow,” based on the novel by Lyndsay Faye, transports audiences to the underbelly of Victorian London as Sherlock Holmes and Dr. Watson pursue the infamous Jack the Ripper.